Nigeria’s domestic debts hit N14.06tn in June – NBS – Royal Times of Nigeria. The National Bureau of Statistics (NBS) in its report on Nigerian Domestic and Foreign Debt – June 2017 data yesterday, said Nigeria’s foreign debt stood at $15.05 billion, while the domestic debt portfolio was put at N14.06 trillion in June this year. This statistic as given by the NBS represents a growth of $3.64 billion and N0.04 trillion respectively within a six-month period. The NBS showed that $9.67 billion of the debt was multilateral; $218.25 million, bilateral, while $5.15 billion was from the Exim Bank of China, credited to the Federal Government. Federal Government debt accounted for 74 percent of Nigeria’s total foreign debt while all states and the Federal Capital Territory (FCT), accounted for the remaining 26 percent. Total Federal Government’s debt accounted for 78.66 percent of Nigeria’s total domestic debt, while all states and the Federal Capital Territory (FCT), accounted for the 21.34 percent balance. A breakdown of the Federal Government domestic debt stock by instruments reflected that N7.5 trillion or 68.41 percent of the debt was in Federal Government Bonds. About N3.3 trillion or 29.64 percent are in treasury bills, while N215.99 million or 1.95 percent are in treasury bonds. 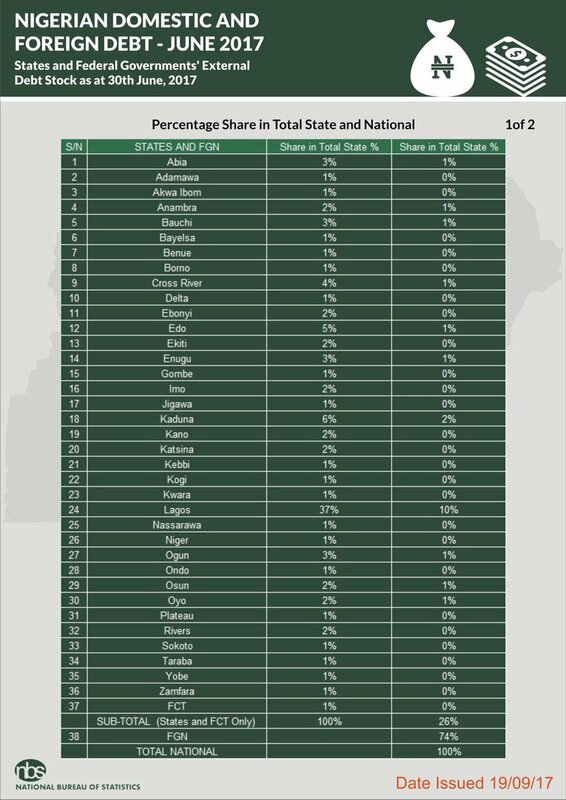 Lagos State has the highest foreign debt profile among the 36 states and the FCT, accounting for 37 percent; Kaduna, 6 percent; Edo, 5 percent; Cross River, 4 percent; and Ogun, 3 percent, followed closely. 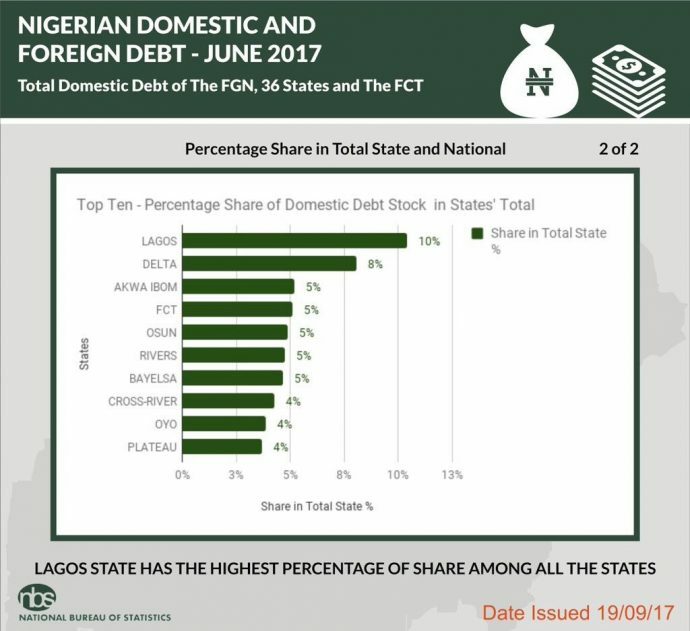 Lagos State had the highest domestic debt profile among the thirty-six states and the FCT, accounting for 10.39 percent; Delta, 8.04 percent; Akwa Ibom, 5.18 percent; FCT, 5.09 percent; and Osun, 4.90 percent, followed in that order.